This Friday, April 12, 2013 – you are invited to celebrate the neighborhood of Oakland. The Oakland Task Force has organized Oakland Forever. 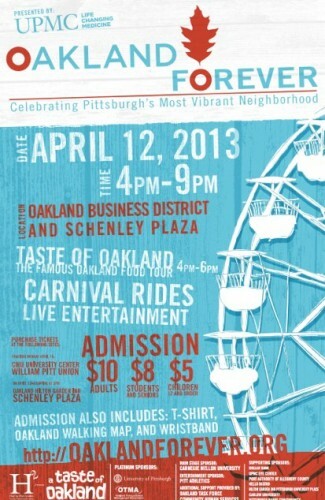 Okland Forever is a mega event at Schenley Plaza and includes the food tour A Taste of Oakland. More details on the event are belwo. While I know many of you are thinking I’ve lost my mind – Oakland is a crowded place where you sit in traffic and try to avoid hitting the many college students and doctors who are criss-crossing Forbes and Fifth Ave 24 hours a day. Well, sometimes that is the case, but I think we need to look past the traffic and dig a little deeper into what Oakland means to Pittsburgh and the revitalization of this city. Pittsburgh has emerged from the decline of industrial economy fairly well compared to most of the other rust belt cities. Much of Pittsburgh’s success has been attributed to Meds and Eds – and Oakland is the heart of both medicine and education here in Pittsburgh. While I know there are many strong feelings about UPMC’s relationship with the city, which has been good and bad, for the purpose of this post, lets just focus on the impact that medicine in general has had on Oakland and Pittsburgh. The Atlantic Cities – Why Eds and Meds Alone Can’t Revitalize Cities, Richard Florida (September 18, 2012)- which this article points out some of the risks of Eds and Meds, it does show that Pittsburgh and Cleveland were successful with Meds and Eds, but this might not be the best strategy for other cities for revitalizing. I’d like to make the argument that the next renaissance for Pittsburgh is going to come from the startup community. Over the past 12-18 months there has been an incredible wave of activity in the Pittsburgh entrepreneurship scene. This past weekend – hundreds of people attended the 3rd Startup Weekend Pittsburgh – where teams worked to build a company in just 48 hours. One of the interesting things to note about Startup Weekend is that it is one of handful of events that is successful in getting students out of oakland and collaborating with other Pittsburghers who aren’t necessarily students. With Oakland home to both Carnegie Mellon University and the University of Pittsburgh, the neighborhood is really best positioned to be the birthplace of the future businesses that drive Pittsburgh’s economy. Real Estate in Oakland is at a premium and mostly occupied by universities. Much of Pittsburgh’s startup activity has been pushed to neighborhoods, like the Southside and East Liberty, which are close but that aren’t as convient for students to get to and from Oakland. (Keep an eye on StartUptown – which is an impressive co-working space that is slightly more convient to the Oakland Schools. With Uptown being right in the middle of Pitt, CMU and Duquesne – hopefully this will continue to grow as a startup friendly neighborhood). There has been some efforts to do more to connect current students to the entrepreneurship community – much credit goes to Spencer Whitman who attended college in Pittsburgh and is now starting a company here. Spencer has been organizing Entreburgh a monthly lunch at The Porch to make it easier and convient for students to interact with others in Pittsburgh’s entrepreneurship community. 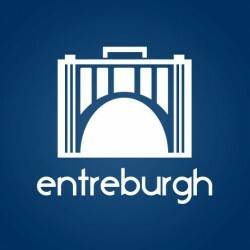 You can learn more about Entreburgh here on Facebook and sign up to attend one of their monthly lunches. The more mixing (and collaborating) between the university community in Oakland and the rest of Pittsburgh – the better off both communities will be. Not only is Oakland home to major universities but it is also a livable neighborhood with affordable housing within walking distance of parks, libraries, and museums. A great introduction to the neighborhood is Oakland Forever this friday at Schenley Plaza. Food, Carnival Rides, Music and More.